Skip ahead to the cut of meat you're interested in by clicking the links below. 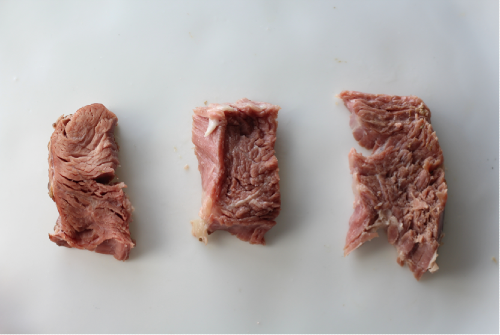 Otherwise, read on to learn more about how sous vide works for different types of meat. Your sous vide immersion circulator probably comes with an app that gives you time and temperature suggestions for cooking your food. If you want to stick with those guidelines, feel free! But my goal is to give you enough food science knowledge to be able to determine yourself the correct amount of time you’ll need to cook the beef of your choice. You can also read my previous article to learn what sous vide is all about. Now, you are ready to get cooking. 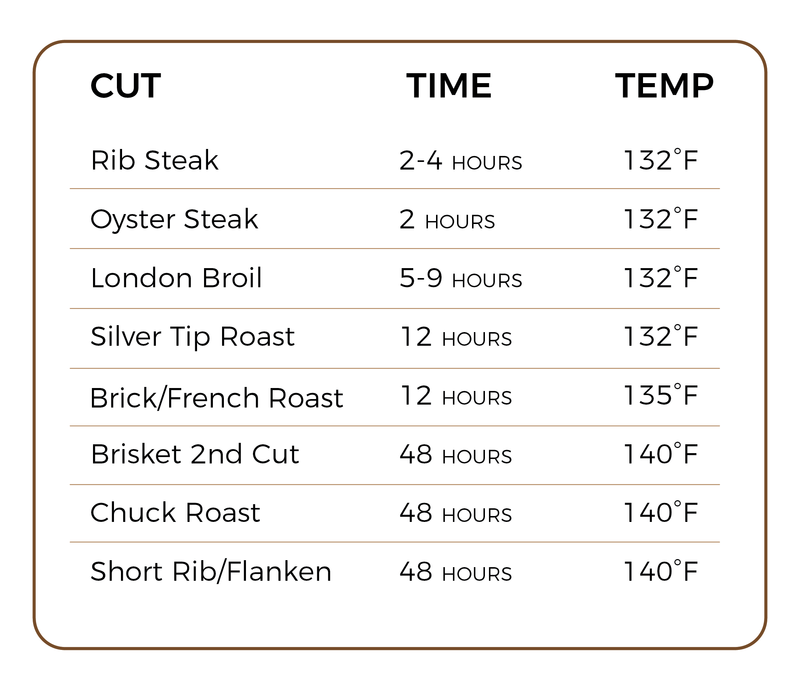 Once you’ve decided on a cut of meat, how do you determine the cook temperature and cook time? 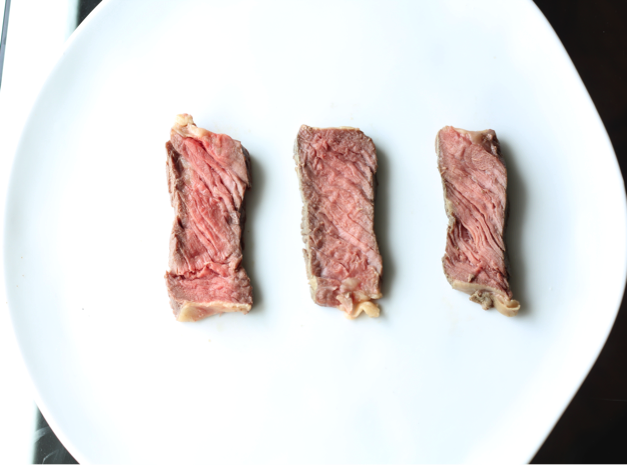 There are certain factors that are very important when cooking meat with any method, including sous vide. Is the cut a tender cut of meat that requires little time to break down? Then cook it for a short amount of time to the temperature of your choice. Would it benefit from a method of slow cooking that breaks down and tenderizes the meat? If so, it should be cooked for a longer period of time to your desired internal temp. How "Done" Do You Want Your Meat? Ask yourself if you prefer meat rare, medium, or well done? You can easily end up with the exact results you want when cooking with cooking measures as precise as sous vide. Let’s go through some cuts of beef so we can apply these principles practically. Here is a handy temperature guide to keep in mind. 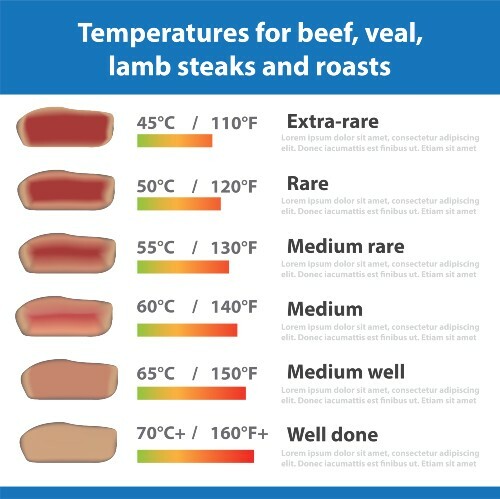 If you don’t know how you like meat cooked, start at medium rare, which is generally the temperature that most chefs prefer to cook their steaks to (130-135°F). One of the most impressive tricks your sous vide can pull off is cooking tough cuts to the temp you like with amazing results. Have you ever had medium rare short ribs? They’re amazing. Sous vide gets a bad rap when it comes to lengthy cooking times. Some cuts do need quite a while to cook, but that’s not the case across the board. Here’s how to figure out what is what. 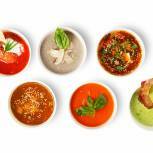 Cuts that don’t require long cooking times when cooked traditionally don’t need to be cooked for days. (And I’m not using ‘cooked for days’ facetiously, like an Instagram caption, I mean for actual days). You’ll want to cook those quick-cooking cuts for the amount of time it takes to bring the center of the cut to the temperature you would like and hold it there for a long enough time to make it safe to eat. Larger and traditionally tougher cuts are where your sous vide will really stand out among other cooking methods. Take the London Broil for example. Generally, London Broil is a very lean shoulder cut that can easily be rendered tough and chewy if just slightly overcooked. It needs to be babysat on the grill or in the broiler, and because of its varying thickness, can be difficult to cook evenly. 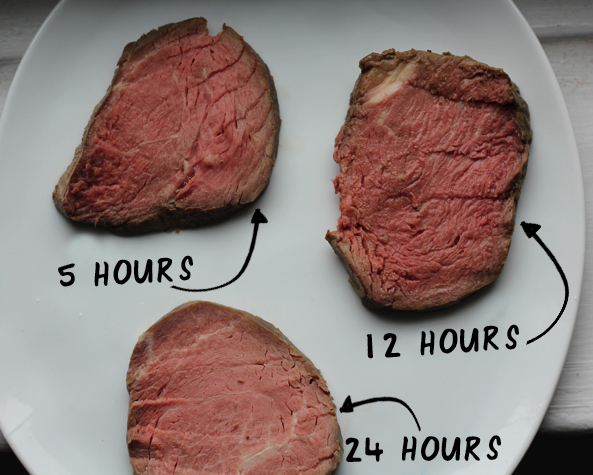 For medium rare (about 130°F), that’s usually around two hours usually regardless of the size or amount of food you’re cooking. Have one rib steak to cook? Two hours. Have 10 rib steaks? Also two hours. For cuts that require fat or collagen breakdown, you’ll get those soft, delicious results after a much longer time in the water bath. You will need to sear your meat to add a crust before serving. For small cuts (steaks and short ribs), do this in a super hot skillet over high heat. For large cuts and roasts, do this in the oven for 20 minutes at 225-275°F. One last thing to consider: fat melts at about 130-140°F (slowly), and collagen starts breaking down at 140°F and accelerates at 160°F. Tip: Is you water bath taking forever to heat? Fill your pot or bucket with hot tap water, not cold, and cut the heating time considerably. These roasts need to be cooked rare, medium rare, or medium. I like medium rare, so I tested it at 132°F for five, 12 and 24 hours. After five hours, a sous vide london broil is tender and still retains a good bit of texture but is cooked perfectly throughout. I would recommend cooking no more than nine hours at the temperature of your choice. Remember, if you prefer your meat medium, just increase the temperature to 140°F. I tested a bunch of steaks at two temperature points: 132°F (medium rare) and 140°F (medium) for four, eight, and 24 hours. The winner was 132°F for 4 hours, although eight hours was also excellent. 24 hours turned the meat fibers very soft, almost mushy, with none of the springy, chewy texture that you want from a steak. Much of the fat does remain intact at 130°F. If you want that fat to melt, cook it at 145°F. Since oyster steak has almost no fat, I cooked this at the temperature I knew I wanted; 132°F, medium rare, for two, eight, and 24 hour increments. The best time was two hours, for a perfectly tender steak. 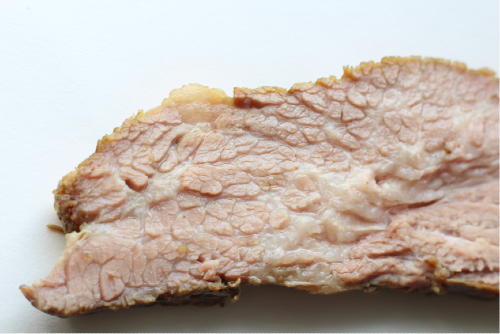 Silver tip is another larger, lean shoulder cut that’s typically sliced and sold as “roast beef” at your deli counter. This cut does have some sinew running through it, but it is an amazingly flavorful cut of meat when cooked properly. Because it is so lean, cooking silvertip traditionally may result in tough, overcooked meat. Depending on your butcher, these may either be interchangeable or just very similar cuts, and they are flexible enough to be delicious whether cooked medium rare with a spice rub or slowly cooked to well done in a sauce. My favorite way to cook this cut is to cook sous vide at 135°F, medium rare, for up to 12 hours. It is also delicious at medium, 140°F, for 8-12 hours as well. My experiments then continued to fattier, tougher cuts of meat. This is always a crowd pleaser, but I was looking for a texture similar to that of traditionally smoked brisket, not the covered-in-sauce version traditionally cooked in the oven. This is yet another area in which the sous vide method really shines. We did a 12 hour, 24 hour, and 48 hour test. 12 hours is not enough to break down the brisket enough, and 24 hours does the job; your meat will be soft and delicious. But the 48-hour bath transforms brisket from a chewy, stringy cut of beef into a tender, luxurious meat. If you can spare the time, the 48 hours is the way to go. As far as temperature, 132°F will get you medium rare brisket that is still super soft with some chew, and solid fat running through the meat. I like it at 140°F, when the fat has begun to melt and seep into the meat, but has not melted through, so the moisture is preserved. If you plan on making your French roast or brisket for a Yom Tov (holiday) meal and would like to reheat it, here’s a great way to do it. For Friday night meals, I keep my sous vide cooked meat warm as follows: After cooking, I pat dry, season, and roast in a 225 degree oven for 25 minutes, to get a bit of a crust. Keep your water bath at the temperature at which you cooked your meat. After baking, place the meat in a new bag, and return to the heated water right before Shabbat with the machine turned off and put away (just in a pot or bucket of hot water, basically). Cover the pot with foil and don’t open until ready to serve. The water is a good insulator and will keep your meat warm. It may not be piping hot when you’re ready to serve, but it will also not be overcooked or dry­­— a worthwhile tradeoff in my opinion. This cut is another excellent application for sous vide cooking. 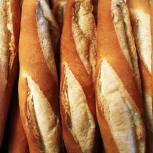 As a shoulder muscle, this very common cut of meat can be extremely tough. It’s usually one of the cheapest cuts in the butcher’s case and can be difficult to cook to the point of tenderness without being dry. As with brisket, it is a very fatty cut and benefits from a slightly higher cook temperature (such as 140°F). I tested chuck roasts at 24, 48 and 72 hours, and as with the brisket, the 48 hour was the clear winner. It was beefy, tender, and delicious. It even reheated nicely, although by the time I was reheating leftovers it was well and truly overcooked. I also tested the chuck roast at 155°F, past the fat melting point. It was certainly well done, but not dried out. 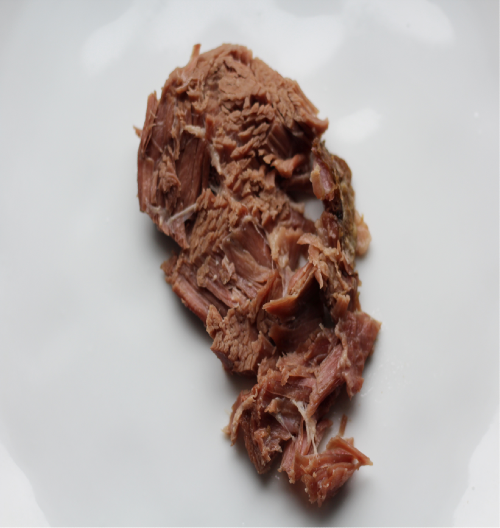 The texture was too soft to slice, but it made excellent meat for pulled beef or a stew. It would be great simply served over a nice rice pilaf or some mashed potatoes. Along the same lines, other fatty cuts of meat, like short ribs and flanken would be perfect at the same ranges; 132-140°F for 48 hours. There is no hard and fast rule. Play around with times and temps, and see which combinations you like the best! Or feel free to benefit from my experiments with this handy chart of cuts, times, and temperatures! In the next and final installment, we’ll talk about non-beef proteins that you can sous vide, as well as some other things you can cook in your water bath. In the meantime, have any questions? Comment below, and I’ll gladly help you plan your next amazing meat menu! Want more ways to cook beef? Click here for our collection of the best beef recipes. Can you remove food from a sous vide machine on Shabbat? Get the answers to this and other frequently asked questions about sous vide cooking in Jewish law. Hi, how long would I sous vide a Delmonico roast from Tevya Ranch (round, stringed)? Can I sous vide skirt steak? What temp and for how long?